The pamphlet is not only a fascinating and curious manifesto but also a rigorous architecture analysis an an artist, surprisingly convincing and entirely unexpected. This is the final blog entry of an exhibition about process, in both its content and its form. The exhibition is, by its very title, about the process of making architecture in the new conditions of the digital age, with aspirations for future factory production guided by mass customization, new digital techniques, and the brimming energy and creativity in today’s architectural climate that are triggered by developing streamlined relations between designing and fabricating. But it is also about the process of making an architecture exhibition, which in a sense began three and half months ago when this online journal was launched along with the fabrication of the houses. Indeed this exhibition about process is divided into two almost equal, temporal parts—the three and half months of the online existence, construction, and curatorial assembly and the three and a half months of public viewing of three-dimensional architecture in situ. The exhibition has been an enormous challenge for a vast variety of teams, from the architects’ teams working on MoMA’s west lot, to our exhibition designers and installers in the galleries, to the filmmaker, Joey Forsyte, who spearheaded the research and production of the film loops seen in the galleries, to our catalogue editors who worked with a book that documents things to come as well as things that are, to the wonderful team who designed this Web site as an integral part of the extended reach of the exhibition. A partial list of thanks appears at the bottom of this last contribution from the curatorial team. An exhibition is a process, and an exhibition on architecture requires continual innovation, thinking, and experimenting. We will be as interested in the debates that we hope the exhibition stimulates as we are in the research undertaken to get this far. We especially look forward to the panel discussions with the architects of the five full-scale commissions, scheduled for October 15, 2008, to assess what we have learned from this grand ambitious experiment: both for the future of prefabrication and digital fabrication, and for exhibiting architecture to make new ideas accessible to the broadest possible public. Certainly the architects and assembly crews have learned much, not all of it quite as anticipated, as the hopes of prefabricated design, factory assembly, and just in time (not always) delivery have shown. We look forward to this discussion and hope you can join us. In closing, I thought to offer a more general sense of why I wanted to take on this topic at this scale only eighteen months after arriving at MoMA in January 2007. The escalating popularity of architectural exhibitions demands that a new generation of architectural curators innovate in the format and techniques of display, as well as in the selection of themes that go beyond the mere celebration of the spectacular imagery of recent “Starchitect” projects. What is needed is not only to engage current production critically, but also to confront issues of consequence in a way that is engaged, and engaging for general and professional audiences alike. With the dual audiences of practitioners and lay public in the architecture galleries of museums, as opposed to more professionally focused architecture centers or schools, the challenge is to exhibit not simply the results but the very processes and the larger stakes—creative, social, economic, even ethical—of architectural practices in a world that demands radical change. Returning to the tradition of commissioning 1:1 scale exhibition houses more associated with building fairs than with museums, the curatorial team, in selecting five architecture firms, set out to present prefabricated houses out of doors to recapture the dual popular and professional appeal of model buildings in the long history of experimental building exhibitions. 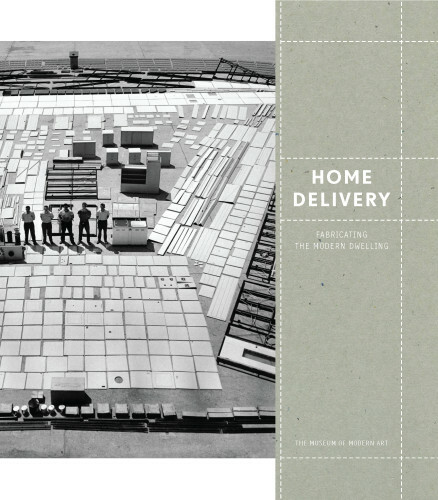 Home Delivery is in certain measure an homage to the most popular displays in MoMA’s 75-year history of architectural exhibitions—the Houses in the Museum Garden of 1949–1955. At the same time, unlike that series, which turned its back on the most advanced fabricating experiments of the post-War period, this set of prefabricated exhibition houses seeks to advance current research into new materials and applications of digital fabrication to create diverse housing types from vacation homes to replacement houses for populations at risk, notably in a house designed for use in New Orleans. The exhibition might be said to have been born of two opportunities: one, the wealth of positions in current discourses on fabrication that have rapidly redrawn the lines between architectural creativity and manufacturing innovation; and two, the unique availability of a large-scale vacant site in midtown Manhattan. Unlike many exhibitions that seek to exhibit only a panorama of a single tendency, it was the curatorial intent to bring together practitioners operating in divergent milieux, both that they might be forced into dialogue (at the very least in the exhibition) and that they may explore their place in a larger historical spectrum of alliances between design and production, which have often characterized the most fruitful moments in the history of architectural modernism for over a century. The announcement shortly after my arrival at MoMA in January 2007 that the Trustees were close to concluding a deal with developer Gerald Hines to sell the vacant lot spanning the midtown block between West 53rd and West 54th Streets—immediately to the west of the Museum—made the moment more than ripe, and the exhibition became unwittingly a chance to test prefabrication’s claims to accelerating the process of construction by staging processes traditionally sequential as simultaneous and separate undertakings, notably site preparation and building assembly. This gritty urban lot (quite different from the outdoor gallery setting of the sculpture garden used by Marcel Breuer and Gregory Ain in 1949 and 1950, respectively) has made possible the display of full-scale prototypes of recent or new prefabricated housing types—types both for urban and suburban use. With the explosion of research into digital fabrication at all scales, notably at several architectural schools which feature prominently in the commissions (MIT, Princeton, Columbia, and the University of Pennsylvania), the moment is ripe for creating opportunities to scale up that research to the prototyping of entire buildings or components of building systems, therefore adding program to the exploding research in parametric design. The five houses, chosen for their immediate realizability, are juxtaposed with three newly commissioned experiments in digital fabrication, the walls deployed on the sixth floor that begin the process of peeling back to revisit the history of modernism and prefabrication. These are integral parts of the gallery exhibition, juxtaposed with historical fragments of prefabricated structures by Jean Prouvé and of the American Lustron House system, from the late 1940s, as well as numerous other designs that constitute a survey of the history of modern architecture’s fascination with developing a replicable house design from the horizons of industrial production. For Peter Christensen, Curatorial Assistant, and I, the continuities and the differences of earlier prefabrication efforts (too readily relegated to a stereotyped failure at mass standardization) are valuable contexts for understanding both the precedents and the new stakes for factory produced architecture in a period of direct communication between a designer’s software and the machinery of fabrication. Much of the greatest promise for unleashing the potential of the research into digital fabrication, beyond the sheer abundance of possibilities often explored for their own sake in architectural school settings, comes from sets of new conditions in the world of global manufacturing that have profound parallels with earlier moments of rapid change in industrial techniques and their consequent discrepancies between different parts of the globe. Larry Sass’s Digitally Fabricated Housing for New Orleans, for instance, exploits a difference in centers of technology for design and centers of handwork for assembly that can as easily be applied between Cambridge, Massachusetts and New Orleans, for instance, as between Bangalore and rural India or between Beijing and rural China. By underscoring the untapped potential for prefabrication nascent or implicit in several of the full-scale projects, Home Delivery sets out to deliver more than simply brilliantly conceived and styled new additions to the growing popularity of prefabrication in the niche market of neo-modernism. Tunji Adeniji, Nancy Adelson, Laura Beiles, Heather Cleary, Maria DeMarco Beardsley, Oliver Berkman, Todd Bishop, Meg Blackburn, Allegra Burnette, Sara Bodinson, Ellin Burke, Ingrid Chou, Claire Corey, Howie Deitch, Margo Delidow, Margaret Doyle, Ian Eckert, Michelle Elligott, Betty Fisher, Joey Forsyte, David Frankel, Priscilla Fraser, Cari Frisch, Sarah Ganz, James Gara, Mike Gibbons, Lucas Gonzalez, Stan Gregory, Roger Griffith, Christina Grillo, Mary Hannah, David Hart, Colin Hartness, Elissa Jo-Hsun Huang, Christopher Hudson, Milan Hughston, Lana Hum, Hannah Kim, Kara Kirk, Andrea Lipps, Patty Lipshutz, Alyson Liss, Glenn Lowry, Jay Manzi, Mike Margitich, Eric Meier, Kim Mitchell, Melanie Monios, Erika Mosier, Jerry Neuner, Nelson Nieves, Linda Roby, Lynn Parish, Peter Perez, Jason Persse, Pamela Popeson, Jan Postma, Emma Presler, Bonnie Ralston, Jennifer Rector, Peter Reed, Rebecca Roberts, Jennifer Russell, Matthew Schum, Sam Sherman, Ron Simoncini, Diana Simpson, Francesca Sonara, Lauren Stakias, Daniela Stigh, Jenny Tobias, Aurelien Vernant, Corey Wyckoff, Carlos Yepes, and Rodrigo Zamora.